The global automotive display market is flourishing driven by technological innovations such as car connectivity and development of infotainment systems. The earlier idea of having a small screen for the central console and CD players for basic operations has completely changed with new, larger, more efficient, and technically-advanced displays coming into picture. Infotainment and navigation systems have become standard features in most cars, whereas luxury car manufacturers have been shifting to the digital instrument clusters, multiple displays in car cabins, rear seat entertainment displays, and head-up displays. Audi A8 and Mercedes-Benz S class initiated the trend of implementing dual screens and multiple touch surfaces. The popularity of rear seat entertainment and infotainment systems of the car has added to automotive display market growth. With an increased need for vehicle safety features, technologies such as augmented reality have turned from a mere concept into reality. Many luxury car brands such as BMW, Jaguar, and Mercedes-Benz have already implemented AR head-up displays in their cars. Augmented reality shows the situation-specific data on windshields than just basic information. The drivers can see external objects as well as their distance and shape on the windshield. In addition, car manufacturers in automotive display market are implementing digital instrument clusters that display more information than just speed and distance. Visteon developed the first all-digital instrument cluster and cockpit, which shows displays throughout the car’s dashboard with curved display panels. 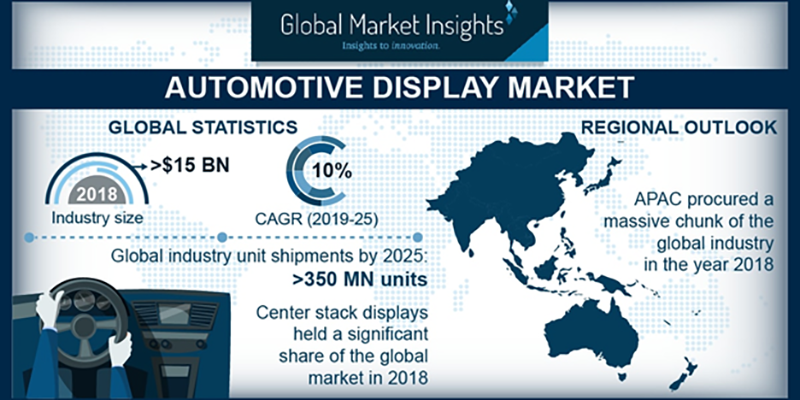 With the growing sales of passenger cars, the rising demand for connected vehicles, and a high disposable income, the automotive display market has been witnessing a rapid growth, particularly in Asian & European economies. Europe is expected to be another dominant region for the market due to the presence of a large number of luxury car manufacturers such as Mercedes-Benz, Audi, Porsche, BMW, and Jaguar Land Rover. Most of the luxury car brands are providing large integrated displays and rear seat entertainment systems as a standard in their flagship offerings such as Audi A8 and Mercedes S class. Moreover, these cars also provide multiple displays in the driver’s cabin for more interactive surfaces in car. These are the key drivers of high growth of the automotive display market in European countries. The disposable income in Europe is higher, which will result in the demand for expensive ADAS systems with more convenience, safety, and comfort features. Currently, most of the display panels used in these systems are TFT LCD displays, whereas OLED panels are expected to be more prominent in the automotive display market in the coming years. Due to organic materials and the use of thin plastic substrates, OLED panels provide the freedom for design as flexible and transparent displays can be made with OLED. Companies such as LG and Samsung are focusing more on OLED panels for automotive displays. Manufacturers are focusing on reducing mechanical components and bringing in more interactive surfaces in their cars. This will augment the automotive display market in the coming years. Continental, Visteon, Panasonic Automotive Systems, Denso, and Robert Bosch are the key players in the industry, offering different products such as instrument clusters, head-up displays, etc. The automotive display market is facing an intense competition with companies focusing on product innovations and differentiation to increase their market share. The companies are bringing new technologies in the industry to gain a competitive advantage. Continental AG increased its research & development expenses by 11.8% in 2018. The company also introduced 3D touch surface technology with haptic feedback and more reliable display, which does not require a driver to look at the screen for operating. In October 2017, Denso introduced the largest head-up display, whereas in 2019, Visteon developed its completely digital cockpit with curved displays for cabin. The competition in the market will benefit customers as automakers are integrating more and more comfortable and reliable displays, fuelling the automotive display market. Though the automotive display market has a high growth potential, there are some challenges and factors restraining its growth, one being the high costs of Advanced Driver Assistance Systems (ADAS). The costs associated with technologies such as augmented reality and OLED panels are higher leading to high prices of cars, which is limiting the automotive display market. The touch surfaces are not yet as reliable as mechanical buttons and systems. In addition, larger displays if not implemented properly results in difficulty of operation, making it unsafe for drivers. Tesla’s large display is an example, which is difficult to operate due to its size and drivers need to look at the display every time while operating it. This problem is being resolved with the introduction of 3D touch surface displays by Continental.